Well for whatever reason the professional atmosphere of this blog has intimidated me just a little bit to the point where my video forecasts are pretty informative, straight forward and to the point. Not that that’s a bad thing because I know people on this blog don’t exactly expect a “Saturday Night Live” skit, but I don’t think I’ve been showing my true passion for weather through my videos lately! Anyway, this evening I decided to loosen up and host the weather video I produced for my school broadcast this morning. It is certainly a different approach to weather than what all my readers of this blog are used to, but I hope you enjoy it anyway! 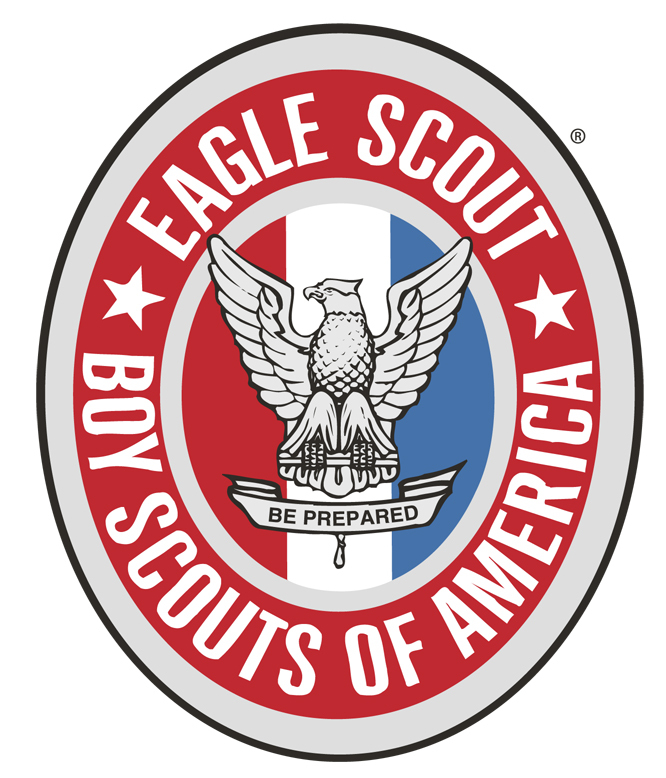 I Am a Proud Eagle Scout! Usually if I miss a day of posting it’s because I was unable to find much time if any at all to sit down and write something. Yesterday was most certainly one of those days. But I suppose I was busy for one reason in particular: I had my Eagle Scout Board of Review last night. Now, those that know me well were surprised to hear I actually completed all my merit badges, my Eagle project and set up a time to have a board of review. Why? Because I am not exactly the most gung-ho, avid scouter. And those that sat in on the board knew that. I enjoyed scouts up until I was about 14 and then I lost interest, and I mean fast. I pretty much gave up. I was 4 merit badges and a project away from getting the award, but I was sick of it. For whatever reason I believed my life at 14 was much too busy to pursue my Eagle award. Pssh, yeah right. I was just being lazy. Anyway, after a talk with my parents when I was about 16 we decided to start it up again and at least finish up the badges and project. It took me two long and frustrating years to finish everything up, and last night was the riviting conclusion to my youth scouting career. And I thought the conclusion was at age 14! It almost was. I probably won’t fully appreciate the award until I’m older, though. Regardless, I’m glad I stuck with it and was able to prove myself worthy of the award even if my participation was lacking during the 2 year time frame between 14 and 16 years old. Now let’s talk about weather because I know you are all DYING to know what it’s going to be like for the next 7 days. Do you want the good news or bad news first? Good news? Well, this is one of those situtations where the news is good for some people and bad for others. Indeed, a very strong ridge is projected to build into our area overnight delivering high temps into the “summer-like” category tomorrow meaning we could have our first 80+ degree day of the year tomorrow! But there’s emphasis on the word *could*. I’ll let y’all know if we reach that number. Wanna know my personal opinion? Anything above 80 is too warm. Plus, my bedroom window faces west so…yeah, it ends up being a rather uncomfortable night for me. But hey, one 80 degree day won’t kill me (and there I go jinxing myself!). Saturday will be a good deal cooler, but still partly to mostly sunny with highs in the low to mid 70s. The rest of the weekend into the first half of next week look downright gorgeous with mid to upper 70s for temperatures under mostly sunny (if not plain ol’ sunny!) skies. The latter half of the week looks a little cloudier, but tempertaures will remain in the 70s—although they’ll be in the low 70s. That’s still comfortable right? I planned on getting a video forecast on this blog today but that never ended up happening…obviously. Tomorrow should be a much easier day for me to get that produced so I’ll get on it! For now, there’s not a whole lot of weather to talk about for the next 7 days. The weatherman in me gets kind of sad when we get to this time of year because that means the storms of rain, wind and snow are all but a distant memory (well, for us a windstorm is just a memory 3 weeks old!) and we are going to be on cruise control for the next several months. I remember last year during the Independence Day time period there were quite a few powerful thunderstorms that formed around the area that would’ve been fun to forecast, but generally speaking summer is a pretty “boring” month for weather forecasters. That’s OK. We need a summer vacation too 🙂 Plus, it gives us something to look forward to come September! So the forecast? Tomorrow looks just like today, except a skosh warmer and a teensy bit sunnier. We’re still trying to push out a lagging front that moved through the area last night and these things tend to take a little while to retire. So, expect temperatures to remain in the upper 60s/low 70s. Thursday looks like an absolutely SPLENDID day with highs comfortably in the mid 70s. Low 70s return for Friday and Saturday as a slightly bigger push of marine air filters into the area, but fear not! 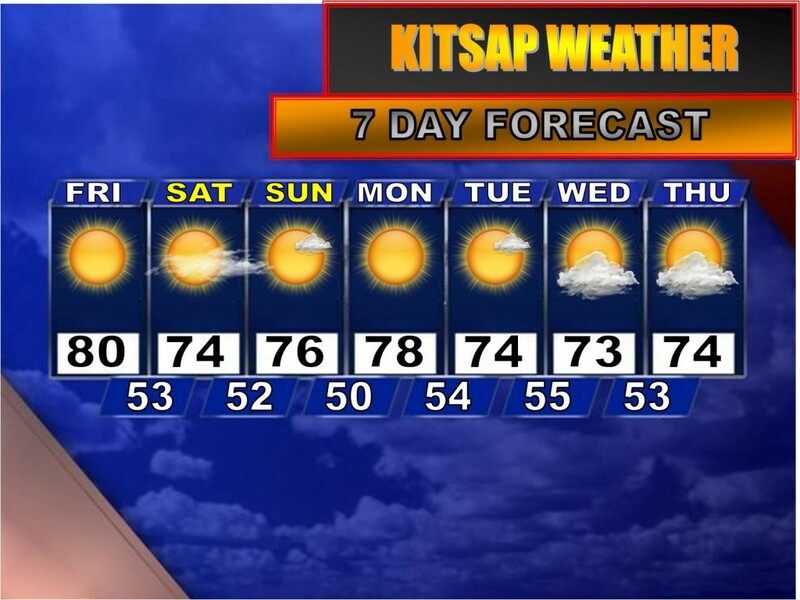 The mid 70s return for the rest of the weekend into next week making a lot of fellow Kitsapers happy. 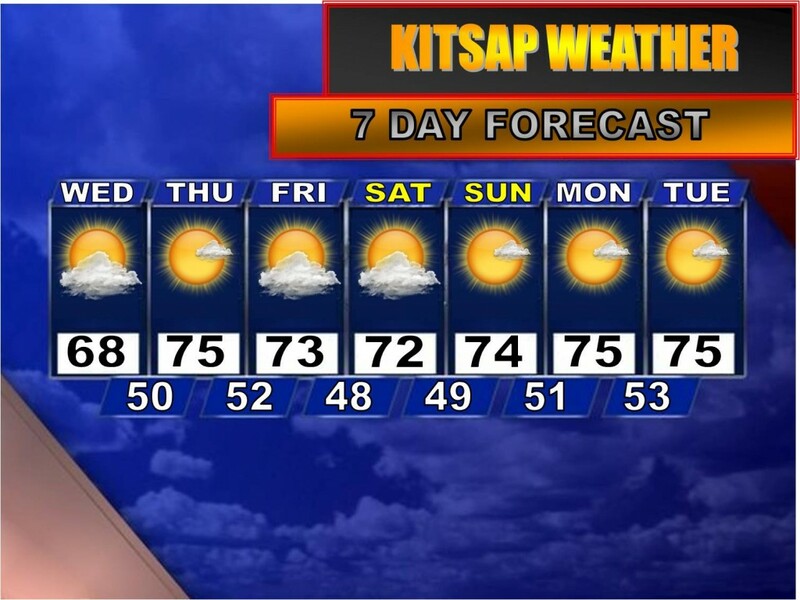 Ahhh…soak it in Kitsap, soak it in! I have found just a bit of time to do a little write-up over this holiday weekend. I won’t be doing a post tomorrow so I decided to at least give a 7 day today. The weekend has so far been beautiful and it will end that way with tomorrow being another mild and partly sunny day, however it appears we will have a bit more in the way of morning low clouds to fight through. And once those clouds burn off, we will have some high level clouds streaming into the area meaning most of tomorrow will be partly sunny as opposed to today’s mostly sunny weather. Now there is a wrinkle in the forecast that has just developed that I should warn you about. Tuesday morning some precip looks to move into the region dropping a few rain showers around the area. It also looks cloudier than Monday meaning mostly cloudy skies. That is the more pessimistic side of the forecast and I bet it won’t end up being as dramatic as the models are advertising. Regardless, the forecast calls for a change in the weather just as well all get back to work and school. We can’t complain too much, can we? 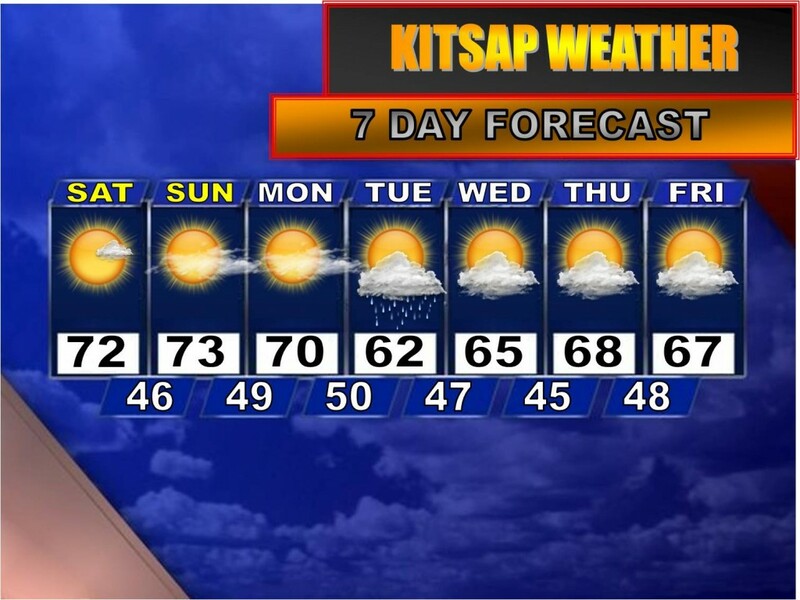 Partly to mostly sunny weather prevails through the rest of next week. I gotta take off now. 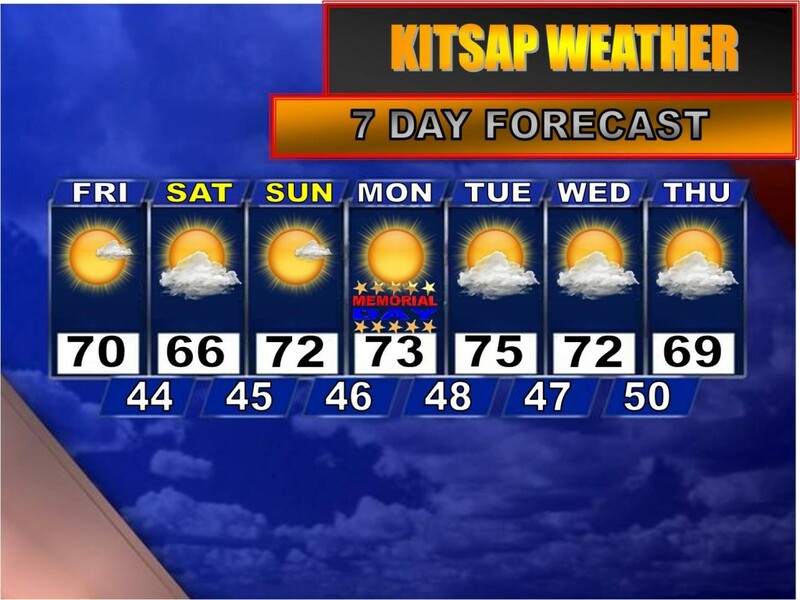 Hope you all have a great rest of your weekend and I’ll be posting a video forecast on Tuesday! So Exactly How Rare is a Sunny Memorial Day Weekend? Days like today are my absolute favorite: mostly sunny, highs in the low 70s, a slight breeze…honestly, can it get any better? I submit it cannot…well, unless you have really high expectations in which case pipe down and enjoy the weather! 🙂 Actually, I haven’t heard any complaints so far. So, is this going to continue into the weekend? You better believe it! 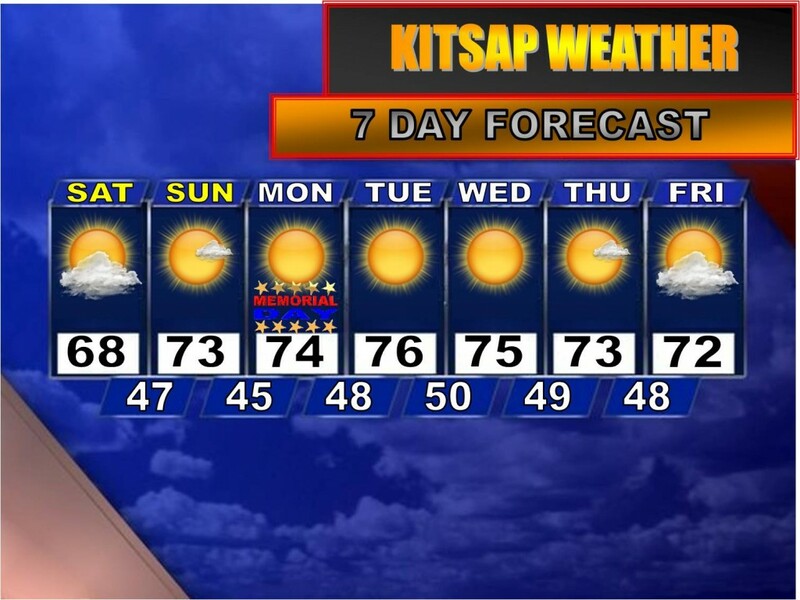 Scott Sistek of KOMO 4 did some research and tried to find how many times in the last 20 years all 3 days (Sat-Mon) of Memorial Day weekend were completely dry. Turns out, it has only happened 5 times, the last time in 2005 so we’re lucking out! The forecast for tomorrow calls for a bit more in the way of clouds and cooler temperatures, but overall it will still be a very pleasant day. Highs will be in the upper 60s to lower 70s. Sunday and Monday and Tuesday and Wednesday…oh yeah, and Thursday and Friday and into next weekend look pretty similar: mostly, if not all the way, sunny with highs solidly in the 70s. Before I go, I feel the need to ask you to heed the National Weather Service’s warning by being careful on the water this weekend. Local rivers and lakes are still very cold and temperatures outside will not exactly be the swimming type. So if you decide to go boating, be safe and just know the dangers of the waters out there during this time of year! It is 6:00 AM. The sun is just on the horizon, the sky is clear and the air is cool…a little too cool for mid May. However, there is no room to complain because the sun is out and it is shaping up to be a pretty pleasant day weather-wise. I walk to my car, unlock it and get inside. As has been a common theme since November, I see my breath float aimlessly in my car because of the cold night the night before. I put the key in the ignition and get ready to drive off, except there’s one thing—dew has blanketed my windshield and I need to use the wipers in order to see the road ahead of me. I twist the little knob on the side of my steering wheel and the wipers go back and forth once, making a horrible scratching noise. I shut them off and stare horrified at my windshield. The dew is frozen. The Killing Frost has arrived unexpectedly. Indeed, I sat stunned in my car for several seconds staring at my windshield, thinking frustratingly, “How in the world am I sitting in my car with a frozen winshield in the middle of May? FROST SEASON IS OVER! It’s not even technically freezing out! It can’t frost above 32 degrees!” But I quickly stopped myself. How foolish of me! 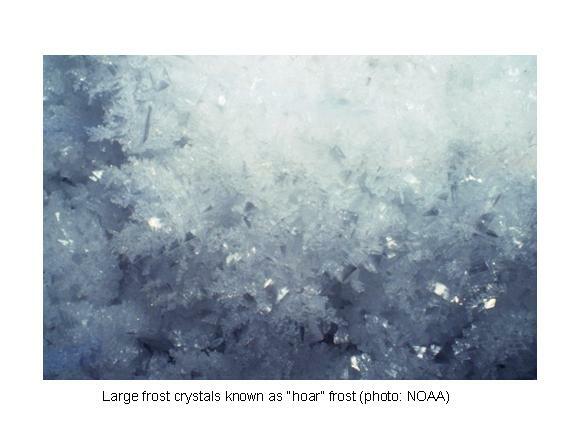 Frost can definitley occur above freezing, and has done it several times this season without a lot of us even knowing it. But how can that be? How can the late-season Killing Frost be active? Have you ever heard weather anchors use the term “surface temperature?” Surface temperature is the temperature of the air 4-6 feet above the surface which is what most weather observatories use for the surface temperature forecast, so it is a little misleading. The closer to the ground the cooler the temperature, making sense because cold air sinks and is heavier than the air above it. The radiation of heat away from the ground causes the temperature to drop. So here’s what I THINK happened: it was a still, calm night (1st ingredient for a frost) and the clouds steadily increased through the night hours helping keep most of the moisture from the day previous still intact by the time the clouds parted early this morning. It is important to note the coldest time of day is typically between 4-6 AM, so the clouds couldn’t have parted at a better time to allow quick cooling and a brief glaze of frost on some surfaces. In fact, between midnight and 3 am the low tempertaure was only at 46 degrees. But by 4 am the temperature plummeted to 41. So, even though last night’s official low surface temperature was 41 degrees, the ground temperature (though not official considering I don’t have a ground thermometer) was likely at freezing or below, resulting in an unexpected frost. And WHY the ground temperature was so cold I don’t know. I’m still dumbfounded by that myself! Speaking of which, Memorial Day weekend looks absolutely splendid…and frost free! Highs tomorrow will likely get close to 70 with Saturday looking like a cooler day in the mid to upper 60s. I know, I know, I said Friday would be the cooler day but the models have flip-flopped on that idea. Bottom line, it’ll be dry. Sunday through most (if not all) of next week will be partly to mostly sunny and positively, absolutely, no question BEAUTIFUL with highs in the low to mid 70s and a slight sea breeze to keep things from getting too warm. I have to say, May is one of my favorite months not just because it’s my birthday month but because typically the most comfortable spring (and summer) temperatures of the whole year occur during this time. And you know what else is awesome? We may actually have a full 7 days of dry, sunny and pleasant weather for once without the obnoxious cloudy, rainy intermissions we’ve been experiencing lately. VIDEO FORECAST: More Muddled May Madness! If You Liked Today, Then You’ll LOVE Tomorrow! Ahhh…wasn’t it a beautiful weekend? There are plenty of concerned Kitsapers out there pleading, “Please don’t say this is all come to a dramatic end! !” and while I can’t promise we will escape drama this week, I can promise the cold and wet weather won’t rule the 7 day forecast. After a mild Viking Fest weekend with highs in the 70s and mostly sunny skies, Monday’s forecast won’t feel much different, so if any of you have sick days saved up this may be the perfect opportunity to score a 3 day weekend! But then again, next weekend is Memorial Day weekend so perhaps you can wait until then 🙂 Overall though, Monday will be beautiful with high clouds streaming in during the day ahead of a rather ugly system headed our way for Monday night into Tuesday morning. However most of Tuesday looks A-OK as the Olympic Mountains will be our mighty protector once again shielding us from the worst of the storm. Highs will still be much cooler in the 50s. Beautiful Day for a Parade! We sure lucked out, didn’t we? 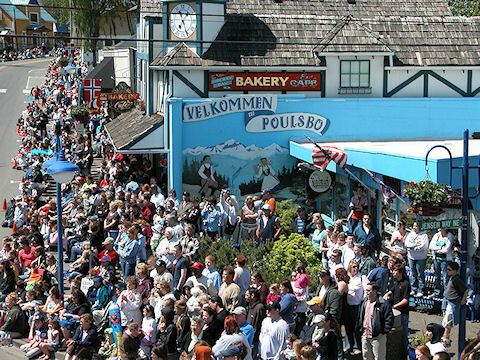 Mother Nature is playing nice by offering up some beautiful weather for Viking Fest weekend. Can you believe it’s here already?? Unfortunately I won’t be able to go today…I’m going to watch my foreign exchange student from Tanzania, Africa play soccer at Bethel High School, but this isn’t just ANY soccer game…if CK wins this one they go on to state! So hopefully you have something planned for today that takes you outside, because it’s going to be a warm one! High’s are expected to soar into the 70s, though if you’re hanging around the water you can expect temperatures to be a bit cooler, likely staying in the 60s. 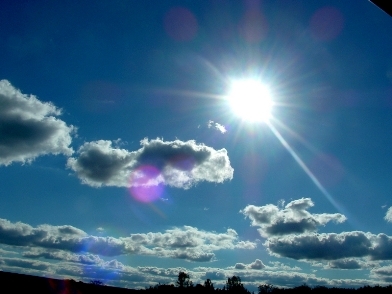 But the sky condition will remain the same: mostly sunny. Tomorrow looks just as nice with mostly sunny skies and highs in the 70s. And wouldn’t you know it! 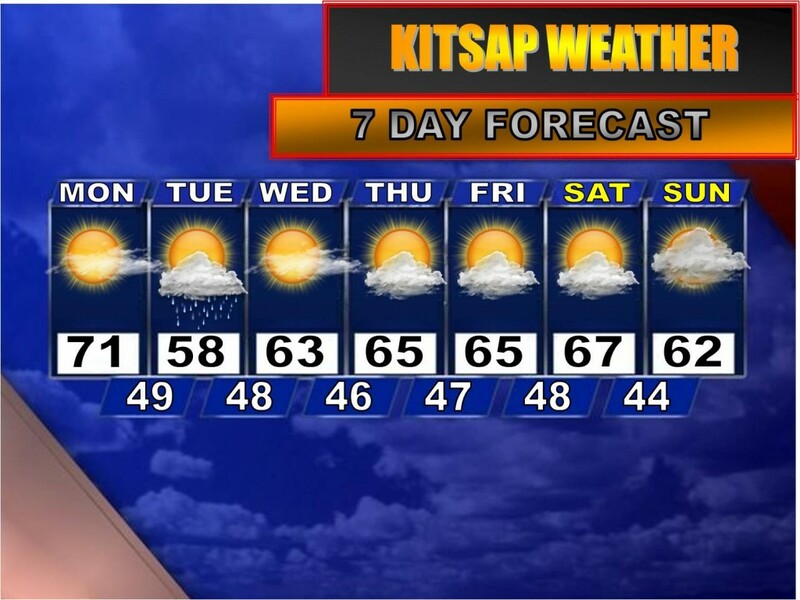 Monday has certainly come around to looking MUCH nicer and MUCH warmer. The moderate rain/clouds that were previously in the forecast have pretty much been obliterated by the models, so it looks like we could score another day in the 70s, though we’ll see clouds increase a bit during the day. Have a great day and get out and enjoy the sun! VIDEO FORECAST: Jaw-dropping May Weather Stats!